Penn Manor students and faculty have an easily accessible, fitness room with weights, fitness equipment and other cardio machines – and it’s all free. However the word “free” does not seem to matter to many. A new trend has emerged, despite the tight economy, that even though students and faculty have this luxury, they do not always take full advantage of it. Some use both the school’s weight room and their own gym membership, and some just totally avoid the school weight room altogether. Abby Barley, a junior at the high school, explained that she goes to Hempfield Rec because her parents also go there and they have a family membership. Senior Lizzie Pflumm joined the Lancaster YMCA also because of a family membership , and she does not use the weight room at the high school. “The treadmills here aren’t very good, and I don’t like working out with people I know,” Pflumm said. “There’s no pool to use for swimming either,” Pflumm said referring to the high school facilities. There are a plethora of reasons why athletes pay for gym memberships, but senior Jere Vital, voiced a different reason. 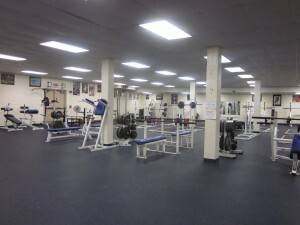 The Penn Manor students are not the only ones who have access to the weight room but sometimes don’t use it. The faculty does too. Scott Lackey, phys ed teacher at the high school, states that he does use the weight room, but because he lives out of town, he has a membership at the West Shore YMCA. He only uses the fitness room when he’s at school. 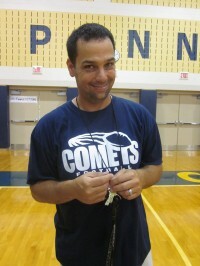 Biology teacher, Erick Dutchess, is a member at the Lampeter YMCA.